The base of the bracelet is a ladder of matte copper bugle beads with a rosey iris finish to them. 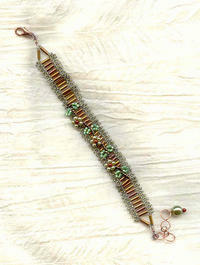 The sides of the bracelet are a lace of dark moss green glass seed beads. 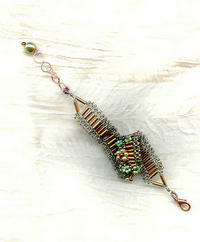 The copper plate lobster claw and wired loop closure gives the bracelet a working length of 7-1/2" to 8-3/4". The technique for making this lovely piece is both intricate and time-consuming, making the bracelet a veritable STEAL at this price. We're a generous crew, here at SPARKLE PLENTY!